Having studied at London Art Portfolio, starting with 1-1 tutorials and then completing the 24 week portfolio course and then some more 1-1 tutorials, I whole-heartedly recommend studying there. It was a life changing experience for me, where I was supported in my artistic growth as well as personally. Everything you need is covered to develop your portfolio on the 24 week course from observational drawing, to life drawing, then project work, researching, collage, 3D model making, mark-making techniques, sketchbook work, idea development and much more, including visits to prominent exhibitions and encouragement to research artists and art history. I then chose to have 1-1 painting classes with Julia after the 24 week course, to develop my oil painting further which was invaluable. The wonderful thing about LAP is that you not only leave with a great portfolio and a digital portfolio, but it prepares you so throughly for your next step in your artistic journey. Not just in your artistic skills but also your knowledge of artists and how you ‘think’ about art and approach and develop your projects. Having now started another course, I feel I’ve been prepared fully for all aspects of my course, which I feel is the most important thing. Julia has been a wonderful tutor and mentor. She is encouraging and passionate about her subject and her tutoring, and is very approachable, both when teaching and also pastorally. The other staff are also great and encouraging, all specialists in their fields. The location of LAP is perfect, just a short walk from London Bridge Underground Station. Thank you all for your kind support and help through my studies at LAP on the 6 week course. I want to thank Petra especially for her support, I enjoyed my 1-1 classes with her so much. I appreciated my time in LAP very much. I will miss you all. LAP is really great! Originally from South Africa and having lived in the United Arab Emirates for 9 years as a Flight Attendant for Etihad Airways, Vanessa wanted to start a new career path in Fashion Design. In September 2014 she joined our 24 Week Portfolio Preparation Course to begin this transitional process. It has been a great pleasure studying in London Art Portfolio for the past 24 weeks! I wanted for so long to change my career as a flight attendant to become a fashion designer yet I didn’t know where to begin as I was hopeless in drawing and had no background in Art at all and was a complete beginner! Julia and her team were very welcoming and I felt at home. The atmosphere is warm and the classes are really small so you get one to one tutor support. I was taught figure drawing, went to Museum exhibitions, field trips, which led to my initial project ideas. The tutors were always there to guide us and accept our ideas as valuable. I enjoyed printmaking and model making as well as Draping and fashion illustration. Sometimes I look back and think I cannot believe that before this course I didn’t know anything about drawing and it used to be very frustrating trying to express my ideas on paper. I am also happy to report that I have been accepted to study with two Universities in London including London College of Fashion. Whist completing her final year of her Degree in Economics at University College London, Doris, as a beginner, decided to block book 1-1 tutorials which she attended two evenings per week through the year. 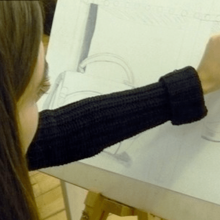 These 1-1 Tutorials enabled her to build and develop her creative skills and successfully gain direct entry onto the Footwear and Accessories Design Degree. It is a beautiful start and I will not stop pushing myself even harder. I chose BSc Economics as my undergraduate degree three years ago, not because I love it that much, but because I am capable of doing it. After two summer internships in the related fields, I realised this is not what I want to do for the rest of my life. Life is too short for things that you don’t enjoy. Having always been interested in the footwear industry, I took short footwear and buying courses in London college of Fashion during my year two. University work was intense, but I enjoyed every moment while sketching or even rushing to evening lessons after university tutorials. I started looking for serious art tutorials in London even I do learn Chinese drawing back in China, then London Art Portfolio came into my sight. Honestly, I wasn’t expected that much change of myself, not only drawing skills but most importantly, the way of thinking like an artist. To try new things, new ideas, new materials (getting messier and crazier). The way to work with your portfolio, getting organised after the whole design development and choosing pieces of work that represent the best of yourself is the core of the later stage. With all the help these 1-1 lessons from Julia herself, Johnny, Petra and Andrea, I have developed my own nice portfolio for footwear design and got in Polimoda for my new undergraduate course in Footwear & Accessories design. I couldn’t be much happier and I want to say a big thank you for everyone who has helped me along the way. Year three wasn’t easy at all with university work and my portfolio build-up but I made it and it all pays off. If you are looking for good quality portfolio done, you definitely should come to LAP. With all helps from Julia –she knows her administration info for university very well and is always passionate about design/teaching (I will see her in Florence :p) Petra who is always assertive, knows exactly what she’s looking for in art work/design and will always give you useful advice + inspirations. Johnny, who was my first tutor in LAP taught me how to get even crazier, loosen up myself and how to do my research for my projects with different media. Andrea who is always there to answer my super long emails, weird timetable changes and helped me with my digital portfolio at the last stage. I couldn’t be more grateful for what I have achieved. Thank you all! Lastly, one piece of advice, do work hard and finish your work on time, otherwise no one can help you 🙂 good luck! “My experience during the 12 week portfolio course at London Portfolio marked a very memorable impact on my career and stay in London. 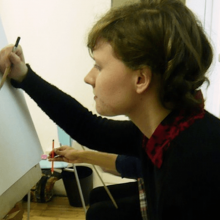 Julia Dennis’ extraordinary skills with figuring out each students missing gaps in their Art and Design career is a powerful reason I recommend this workshop to any potential design/art student and professional. Simona is an international model having modelled in Bulgaria, Milan and Paris and has appeared on the front cover of magazine. 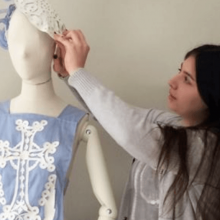 Wanting to follow her interest in pursuing Fashion Design, Simona joined LAP to develop her creative skills and build her confidence, which led to her direct entry onto the BA Fashion Design at Instituto Marangoni. “Straight after graduating high school I started working in the fashion industry and that is what I have been doing for the past three years. Several months ago, however, I felt that I wanted a career change, from professional modelling, and I decided that I would pursue my dreams of gong to Art College. At first I was uncertain of my own abilities and I lacked confidence. That is why I decided to seek the expertise of Julia at London Art Portfolio. She made me feel comfortable from the very beginning and starting from our first one-to-one tutorial I began to develop my drawing skills. She made sure that throughout our time together we explored different mediums, techniques and approaches. We visited museums, explored different artists, made thorough research on various topics and never stopped seeking inspiration. That is why my learning process was enjoyable, diverse and educational. Preparing for the future beyond her modelling career, Aleksandra joined the 4 Week Portfolio Preparation Course at LAP followed by 1-1 Tutorials. 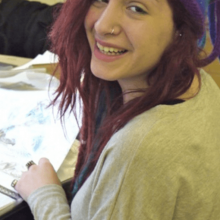 This propelled her onto a Foundation Course at CSM and prepared her for a new career in art and design. “I attended London Art Portfolio in July 2012. As a professional model at the age of 32 I decided I wanted to change my life and learn a new profession. I had a keen interest in arts but never specific education, so I didn’t know at that time whether my dream was even in the realm of reality. Before I attended London Art Portfolio, I attempted working on my portfolio for CSM (yes I was aiming high) but this quickly ground to a halt. I opted for the 4 week preparation of the portfolio course at London Art Portfolio where I met Julia. This proved to be one of my best decisions. The class was small and felt more like one-to-one tutorials than a class. Julia was very attentive and the atmosphere was supportive. Julia structured the class around themes, but worked with each student separately recognising the individual style and helping us to develop some new techniques and broaden our knowledge about some significant artists and art movements. She gave us space to work on the portfolio to find our way, but was there in the blink of an eye whenever we encountered problems. Julia has so much experience and knows exactly what the examiners are paying attention to. When the course finished I took advantage of one-to-one tutorials to structure the portfolio and craft the motivational letter which is very important especially in the case of career change like myself. “Kurs zaczęłam w lipcu 2012 roku. W wieku 32 lat, nadal pracując jako modelka, stwierdziłam, że chcę zmienić swoje życie i pójść w nieco innym kierunku. Zawsze interesowałam się sztuką, ale nie skończyłam żadnej szkoły o profilu plastycznym, więc nie wiedziałam czy to teraz będzie możliwe, aby próbować swoich sił na kierunku artystycznym. Starałam się pracować inwidualnie nad swoim portfolio, ale szybko zorientowałam się, że to nie takie proste, więc zapisałam się na czterotygodniowy kurs w London Art Portfolio, gdzie poznałam Julię. I to była bardzo dobra decyzja. Grupa była mała (max. 6 osób) i miałam poczucie, że nie jest to typowa klasa, ale bardziej była to praca inwidualna pod okiem nauczyciela. Atmosfera zajęć była bardzo miła i swobodna. Zajęcia Julii oscylowały wokół pewnych tematów, które były zapodawane, ale każdy student podchodził do nich w swój bardzo inwidualny i kreatywny sposób. Julia bardzo dbała o to, by każdy mógł maksymalnie wykorzystać swój czas w studio. Często podpowiadała na jakich ważnych artystów bądź kierunki w sztuce warto zwrócić uwagę, jakich technik użyć, jak najlepiej pokazać spektrum swoich własnych możliwości. Nie przeszkadzała. Nie narzucała się, ale była wtedy, gdy w pewnych momentach potrzebna mi była porada profesjonalisty; kogoś, kto okiem artysty potrafi ocenić i doradzić. Julia ma ogromne doświadczenie i wiedzę, którą chętnie dzieli się ze swoimi uczniami. Kiedy kurs się skończył, spotkałam się z Julią kilka razy (1:1) by lepiej zbudować i nadać pewną strukturę mojemu portfolio. Julia pomogła mi również przygotować się do napisania listu motywującego, który jest oceniany na równi z portfolio.